This week we will be looking at an amazing dinosaur who's remains were discovered almost fifty years ago, but nobody really knew what it looked like truly until this past year. Make way for Deinocheirus mirificus! Deinocheirus was a large, feathered dinosaur that measured about thirty six feet long from beak to tail. It lived in what is now Mongolia, during the late Cretaceous era, between 71 and 69 million years ago. When alive, Deinocheirus was an omnivore, feeding on plants and small animals, like fish. 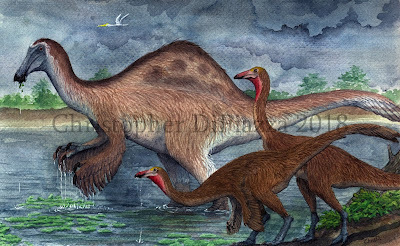 Deinocheirus being joined for a drink by two Gallimimus. Watercolor by Christopher DiPiazza. Deinocheirus is a great example of how paleontology is a field where scientists are always learning new things. This dinosaur, like I stated, was discovered almost fifty years ago, in 1965, in the form of arms. That's it. Just a set of huge, eight foot long arms, each tipped with three roughly equally long fingers, armed with curved claws. It's full name, Deinocheirus mirificus, even translates to "unusual horrible hand" because that is mainly what paleontologists had to study from this animal for a very long time. These huge mysterious hands and arms were by themselves very impressive. 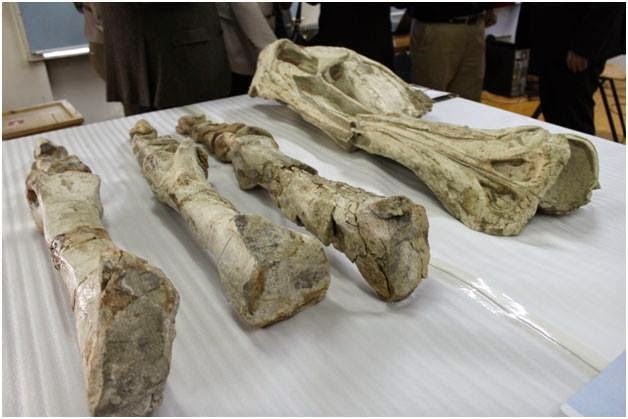 They were the longest forelimbs from a theropod dinosaur ever discovered! This caused the imaginations of many people to run wild with visions of a colossal superpredator, using these claws to tear apart any other dinosaur it coexisted with. When examining the claws and the hands more closely, however, it was discovered that they were most similar to the shape of the arms and hands of ornithomimosaur theropods, like Struthiomimus. Ornithomimosaurs are characterized by having long, bird-like necks, small heads, and beaks with very small teeth, or in some species, no teeth at all! 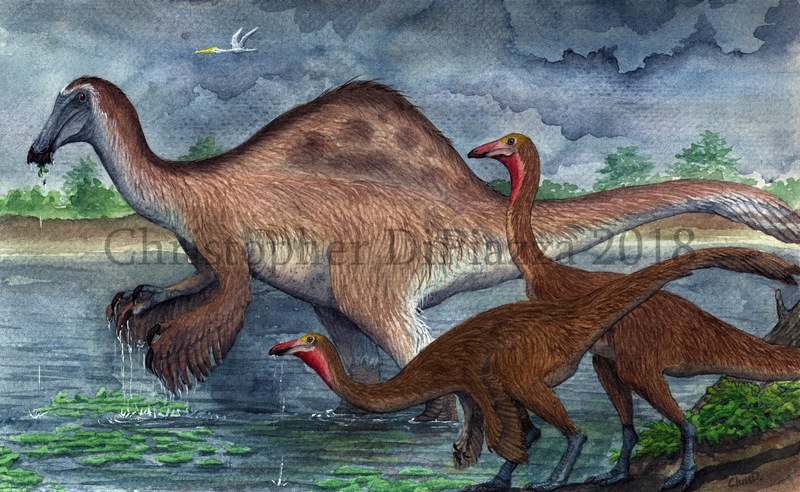 Deinocheirus, although big, was most likely not a monster-sized terror if it was anything like its closest relatives. This is all anyone knew about this dinosaur for many years. Deinocheirus was just a big set of arms that was often reconstructed as some sort of extra bulky ornithomimosaur...until the mid 2000s when the rest of it was found, and ultimately published this year. It was revealed that the mysterious Deinocheirus was stranger in appearance than anyone could have ever imagined! Casts of the Deinocheirus arms found in the 1960s on display at the American Museum of Natural History in New York. Two, nearly complete between the both of them and what is already known, specimens were unearthed in Mongolia during the mid-2000s. Amidst their discoveries, poachers actually stole some of the bones and sold them to illegal markets. These bones were resold a few times in different countries before someone got a hold of them and donated them to the Royal Belgium Museum of Natural Sciences, which in turn, finally returned them to Mongolia with the rest of the skeleton. What a journey! So what did these bones tell us about the rest of Deinocheirus? Where to begin? Oh! It had a hump on it's back. Yes, the neural arches (top portion of the vertebrae) on the back were extremely long and formed a triangular, almost shark-fin shape over the animal's mid-section. It is believed that these structures would have anchored more muscle for the animal's thighs, sort of like the hump on a modern bison's neck, which attach muscles to the shoulders. Deinocheirus also had a toothless beak, which was narrow near the eyes, then flattened laterally at the tip, which was wide and almost squared off. The stomach contents found in these new specimens showed the remains of fish and plants. If we look at modern dinosaurs with similarly shaped beaks, like ducks and spoonbills, we may be able to guess what Deinocheirus was using its beak for. Interestingly, both ducks and spoonbills also eat small fish and plants. They use their flat bills to sift through mud and water until they find something suitable to eat, at which point they swallow it whole. Deinocheirus' stomach also contained over a thousand gastroliths. Gastroliths are small rocks swallowed by an animal that doesn't chew its food, to help grind food inside the animal's body. Gastroliths have been found in many other prehistoric dinosaurs, and are even used today by birds and other reptiles. Lastly, Deinocheirus possessed a special bone at the tip of its tail called a pygostyle. Pygostyles have been discovered on a variety of other dinosaurs, including oviraptorosaurs. They are mostly seen, however, on birds, and are the site for tail feathers to attach. This means that Deinocheirus would have had feathers, forming a fan-like shape on its tail, similar to those on a bird. It is likely Deinocheirus had more feathers on the rest of its body as well. That is all for this week! Deinocheirus is an amazing, fifty-year long story about how paleontologists are always learning new things and how science, although a fact-based field, can certainly change pretty drastically as new data is obtained. As always feel free to comment below or on our facebook page! Lee, Yuong-Nam; Barsbold, Rinchen; Currie, Philip J.; Kobayashi, Yoshitsugu; Lee, Hang-Jae; Godefroit, Pascal; Escuillié, François & Chinzorig, Tsogtbaatar (2014). "Resolving the Long-Standing Enigmas of the Giant Ornithomimosaur Deinocheirus mirificus". Nature (22 October 2014): 1–4. doi:10.1038/nature13874. PMID 25337880. Osmólska, Halszka; Roniewicz, Ewa (1970). "Deinocheiridae, a new family of theropod dinosaurs". Palaeontologia Polonica (21): 5–19.